As part of earning our commis chef degree our class took on a ‘circle of life’ project, where we adopted a newborn bull calf from a dairy farm at the start of the year and at the end had prepare a five course meal from it for 45 people. 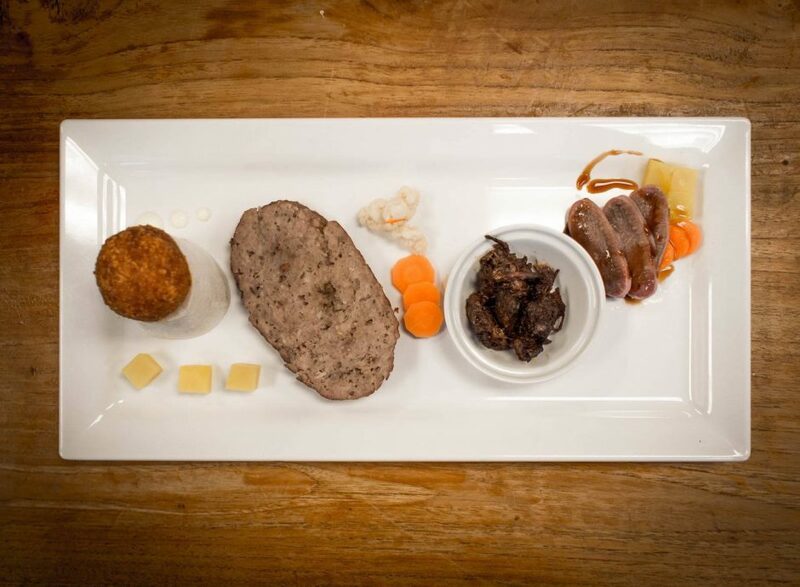 Inspired by revolutionary Dutch chef Nel Schellekens and her nose-to-tail cookbook on using every part of the animal, I decided to create a special tasting dish from our calf’s organ meats for our menu. For this project I also created the branding and decor, which are described in their own post. We wanted to educate our guests on the many delicious yet forgotten edible parts of veal and start a conversation about more responsible meat consumption. Chef Nel Schellekens is the Netherlands’ revolutionary ‘nose to tail’-chef: she insists that if we decide to eat meat, we better make sure we do so in a most sustainable manner and without throwing any edible part away. So when we started to plan our pop-up restaurant’s menu we immediately knew where to look for inspiration: Her cookbook ‘Nel: Van kop-tot-kont-chef’. For my course I wanted to focus on veal organ meats: tongue, braised cheek, stuffed spleen, and a little croquette filled with… testicle ragout. We wanted to only use meat that came from ‘our’ calf to fit our sustainable meat vision thus we choose to serve this course as a tasting platter that each guest would share with the person opposite of them. That way we didn’t have to order any additional meat to supplement the small amount of cheek meat for example. To accompany the these flavors we prepared pickled seasonal vegetables, horseradish mayonnaise for the croquette and a sauce made from Dutch wine and honey served with the veal tongue. As we had hoped we observed lots of conversation among our guests about this course and received really positive feedback afterwards, so we were glad we’d had the balls to put this course on the menu! In ancient Rome a butchered animal was divided in four parts: the first quarter for the nobles, the second for the clergy, the third for the bourgeoisie and the fourth for the army. The working class could only afford what was left: the organs, the head and the tail, hence these various meats became known as ‘fifth quarter meats’. All over the world these meats are rightfully considered a delicacy, except in some highly industrialized countries with large cattle production (like the USA and the Netherlands) where they have been mostly forgotten. We want to put these delicacies back on the menu! When we choose to eat meat. At the start of the year we had collectively adopted a newborn bull calf named Lord Lilly. We visited him at the organic dairy farm where he was born and raised. When he was old enough we picked him up and together with the farmer brought Lord Lilly to a small, clean, well-run slaughterhouse. We witnessed several animals being killed and stripped, including our little bull. This part of the project was very important to me and I would recommend everyone who eats meat to seek out an opportunity to do the same at least once in their life. If we eat meat or even just dairy products we must face the fact that animals are being killed for that purpose. Like with bull calves, many newborn male goats, pigs and sheep are killed in the diary industry because they won’t produce milk and once testosterone kicks in they’ll be too difficult to handle and the meat don’t taste good. However, this practice is not a necessity but a choice we make as a society because we value maximizing profit over animal welfare and ethics. When we choose to eat meat, we should at least work to drastically improve how we treat the animals we eat while they are alive, humanely castrating the male animals and letting them live their life instead of killing them off, and minimizing waste by eating every edible part of an animal that gets killed for consumption.